I found myself in a bit of a funk last night. After mowing the front lawn, I sneaked into my office to pray for awhile. It helped. And then I saw my daughter outside and decided to join her because the hot humid day had finally turned cool and breezy. We road our bikes in lazy circles on the driveway and I noticed, again, the red roses blooming like fireworks along the side of the little house. 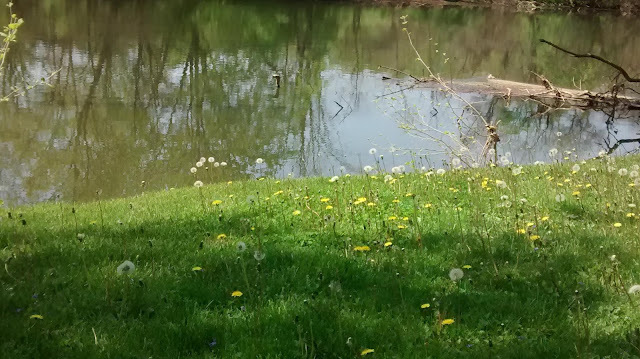 I realized the Queen Anne's Lace was in full bloom too. After I parked my bike, I ran in for a vase and scissors and Sophia and I cut the first bouquets of the season. I felt immeasurably better then, I felt returned to my home, my self. 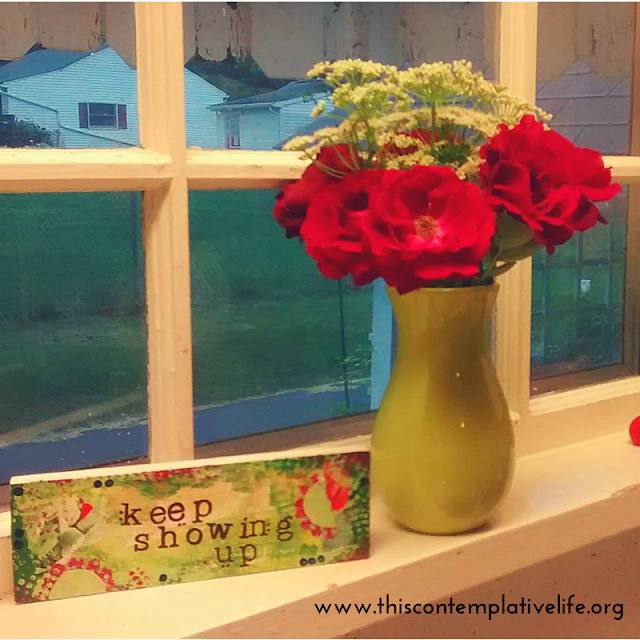 I painted this little plaque last year, based on a note I had taped above my painting station, "Keep showing up." My kids asked what it meant, and I said, "It means keep trying, keep being willing to be where you are, to start again in whatever moment you find yourself in." I think that's part of what happened last night. Thanks to prayer and a cool breeze, I stopped worrying about what comes next and showed up to what was right in front of me - a riot of flowers, a lovely daughter to share the task of cutting the season's first bouquets. Today, friends, keep showing up, consent to be where you are, in whatever you are in. And, when you do, I hope you find flowers, or a friend, or even just a moment's peace and quiet that helps you move gently, hopefully, into the next moment and the moment after that.